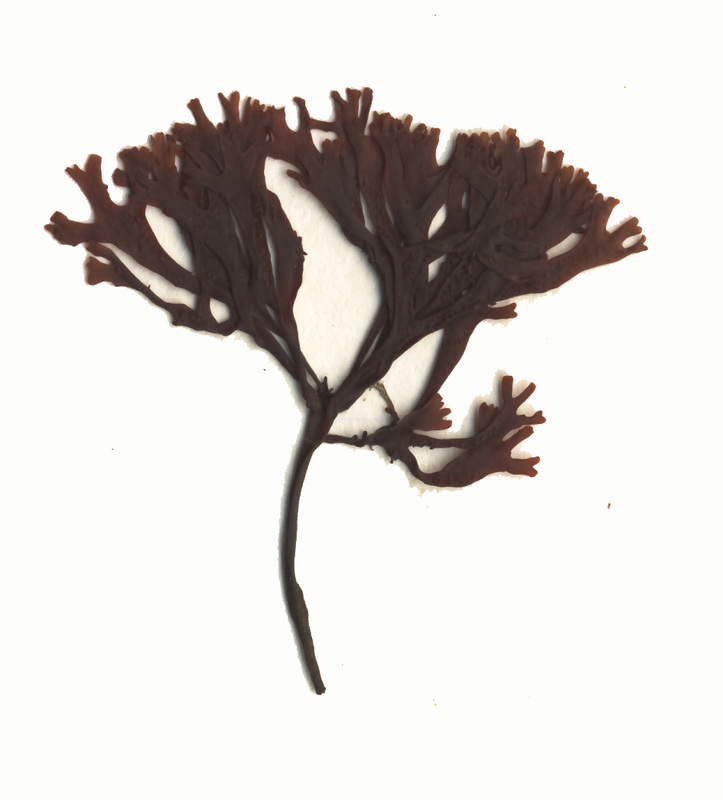 Specimen collection number SCL 15329 in the UBC Herbarium Algae Database. Note the wide angle of the forked stipe branches. Photo courtesy of Sandra Lindstrom. Narrow Turkish washcloth (Mastocarpus jardinii) was recently split into four separate species, one of which is M. agardhii. The gametophyte of this red alga is dark reddish-black, cartilaginous, and grows upright to 15 cm tall with its stipe composing one-third to one-half of this height. The stipe is somewhat cylindrical and fairly smooth; branching, when it occurs, is dichotomous and may be as wide as at right-angles. The blades are narrow (about 3 mm wide) and have slightly swollen edges. The tips of female specimens are rounded, while those of males are somewhat round-toothed or scalloped (crenate). This species has worm-like bumps (vermiform papillae) on its blades. The above specimens were found growing on rock in the low to mid-intertidal of a somewhat protected Calvert Island beach. It has been reported in Monterey, California; north and west Vancouver Island, British Columbia; and Calvert Island on the Central Coast of BC. More details about these specimens and about other occurrences of this species can be found by searching the collection numbers (in photo caption) or species name in the UBC Herbarium Alage Database. Other Mastocarpus species can appear very similar, and while morphological characteristics, distribution, and location in the intertidal can lead to a field identification, genetic analysis is necessary to be certain of a correct identification. Other species of the genus reported on the BC coast are M. vancouveriensis, M. intermedius, M. papillatus, M. alaskensis, M. latissimus, and M. rigidus. See Lindstrom et al. (2011) for information on these similar species.